States, localities, and Head Start grantees are currently using tools designed to reliably measure teacher-child interactions in ECE settings. Both DC and Louisiana use the Classroom Observation Scoring System (CLASS), a well-researched observational tool widely used in early childhood and Pre-K settings, with versions available through high school. Both states took several years to pilot the implementation of this tool to learn more about teacher-child interactions before using it as a quality measure. DC has used CLASS for several years as a citywide Pre-K performance measure in a sample of 3- and 4-year-old classrooms. The DC Public Charter School Board also uses CLASS for Pre-K in its formal Performance Management Framework, the accountability tool for charter schools. Similarly, after the Louisiana Department of Education chose CLASS as a common statewide measure of early learning quality, the state piloted CLASS for several years, working with local early childhood networks to improve local implementation and understanding along the way. Although both DC and Louisiana adopted the same measurement tool, they will use the results in different ways. In DC’s ESSA state plan, Pre-K CLASS will be a sub-component of school ratings, and will count for roughly 3 percent of each elementary school’s rating. Louisiana’s state plan, in contrast, does not use CLASS in formal elementary school ratings, but does use it as the primary quality measure (and improvement tool) in all publicly funded early childhood settings, birth through Pre-K. Beginning in 2016-17, the Louisiana Department of Education began formally rating ECE programs based on their CLASS scores. The state is currently piloting the measure in kindergarten and early elementary grades, and may expand use to additional schools in future years. Observational measures are only as reliable as the people doing the observing, combined with the tools they use and the training they receive. The more weight a state places on such measures, the more important it becomes for them to invest in rigorous, reliable implementation, which can be both costly and time-consuming. Because CLASS results in Louisiana are part of state ECE program ratings, the state ensures that every classroom is observed multiple times per year by trained observers, and the state funds independent checks for observer reliability. States that use CLASS scores as part of school ratings must pursue a similar level of rigorous implementation. But states exploring this kind of measure for the first time, or using it in lower-stakes informational ways (e.g. observing a sample of classrooms to track city-level performance) could explore less rigorous implementation approaches. Measuring teacher-child interactions isn’t the same thing as improving them. Once ECE program leaders know how they compare and where they need to improve, they need effective tools and strategies, along with professional development opportunities such as coaching, to improve the interactions between teachers and children in their classrooms. 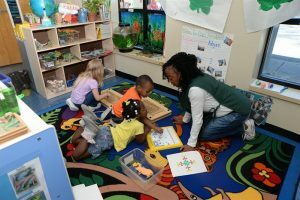 Both DC and Louisiana provide early childhood programs and teachers with training and guidance to understand the meaning of their CLASS scores and what programs can do to improve them. Louisiana coordinates these trainings alongside CLASS implementation by funding local early learning networks, which enable the state to provide localized, on-the-ground early learning support on a large scale. The District of Columbia and Louisiana offer two examples of how to measure and improve teacher-child interactions. ESSA opens the door for more states to explore these and other similar approaches. States can explore, pilot, and evaluate other innovative approaches, and in the process, expand the early education community’s understanding of classroom interactions and what works in birth to third grade school improvement. As this series makes clear, states have many options for meeting the ambitions of ESSA by creating statewide plans that emphasize educational excellence and equity for every student, including the early years.